2Lt Roy A. Larson (P)(KIA-22 Apr 44) - First mission (121) flown as CoPilot with 2Lt Quentin J. Gorman (P). All Other missions flown as First Pilot. Completed 15 credited missions on 22 April 19844 (Mission 139) where he was Killed in Action. 2Lt Ronald H. Duncan (CP)(POW-22 Apr 44) - Stood down on mission 121, Other 14 missions flown with 2Lt Larson. Completed 14 credited missions on 22 April 1944 when he became a POW. 1Lt Louis F. Mikulich (N) - Flew on 8 credited missions with 2Lt Larson (121, 122, 125, 126, 127, 129, 130, 131) and 17 missions with other Pilots: Regular crews (9 missions - 118, 119, 132, 133, 135, 136, 142, 152, 172); As Lead Crew Navigator (8 missions - 154, 163, 165, 172, 175, 179, 182, 185, 195). Completed combat tour on 30 June 1944 (Mission 195). 1Lt Claud Wilson, Jr. (B) - Flew on 8 credited missions with 2Lt Larson (121, 122, 125, 126, 127, 129, 130, 131) and 21 missions with other Pilots: Regular crews (5 missions - 132, 133, 135, 136, 142); As Lead Crew Bombardier (16 missions - 154, 171, 176, 180, 181, 185, 189, 197, 199, 205, 214, 216, 217, 225, 233, 241). Relieved from combat, 30 mission Lead Crew combat tour, on 23 Sept 1944 . Final mission (29th) on 12 Sept 1944 (Mission 241). 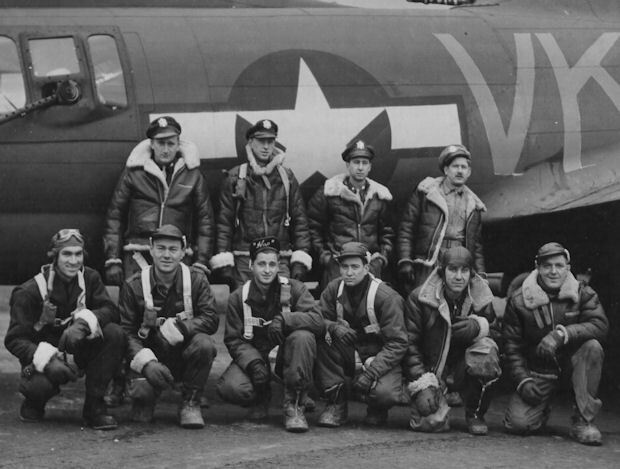 S/Sgt Thomas J. Campbell (E)(KIA-22 Apr 44), S/Sgt Everett E. Culp (R) (POW-22 Apr 44), Sgt Arthur W, Schinker (LWG)(POW-22 Apr 44) - Flew on all of the 15 2Lt Larson missions. Last mission on 22 April 1944 (Mission 139). Sgt Lee Ray Brim (BTG)(POW-22 Apr 44) - Flew on 13 missions with 2Lt Larson (121, 126, 127, 129, 130, 131, 133, 134, 135, 136, 137, 138, 139). Last mission on 22 April 1944 (Mission 139). Sgt Duane P. Thayer (RWG)(POW-22 Apr 44) - Flew on 7 missions with 2Lt Larson (133, 134, 135, 136, 137, 138, 139). Last mission on 22 April 1944 (Mission 139). Sgt Herman L. Hodge (TG)(POW-DOW - 22 Apr 44) - Flew on 14 missions with 2Lt Larson (All 2Lt Larson missions except #133). Last mission on 22 April 1944 (Mission 139) when he became a POW. Died from injuries on 23 April 1944. Buried in Netherlands American Cemetery at Margraten, Netherlands. 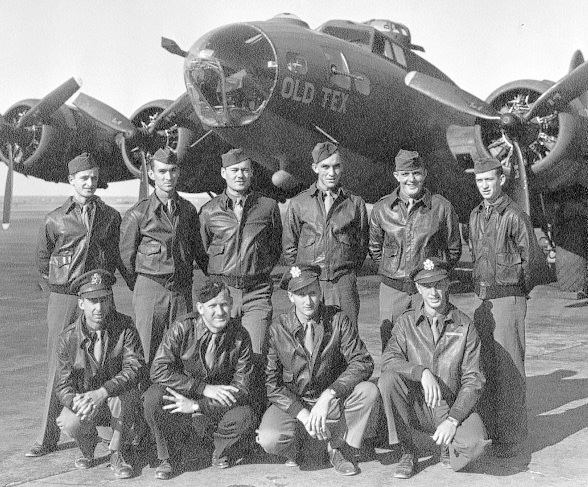 Sgt Edward J. Gammon (RWG) [Not in crew photo]- Flew on 6 missions with 2Lt Larson (125, 126, 127, 129, 130, 131) before Sgt Duane P. Thayer was assigned to the 2Lt Larson crew. Completed 33 combat missions WG and TG on 8 Nov 1944 (Mission 225). 2Lt Milton Feinmam (B)(KIA) - Sub for 1Lt Claud Wilson, Jr. (B) on his 17th credited combat mission. Was a replacement Bombardier on the 2Lt Jack Watson Crew. 2Lt Herbert E. Levy, Jr. (N)(POW) - Sub for 1Lt Louis F. Mikulich (N) on his 24th credited combat mission. Was a replacement Navigator on the 1Lt James B. Taylor crew. (KIA-POW) - 22 April 1944 Mission #139 to Hamm, Germany in B-17G Thru Helen Hiwater #42-39785 358th BS (VK-H). This was the 303rd's first attempt at an afternoon and return after dark mission. The #2 engine and gas tank were hit by flak causing an inferno. The B-17 went into a spiral and went down near Werl, Germany. Radio Operator S/Sgt Everett E. Culp, was thrown into the tail section near the tail wheel just before the tail separated from the fuselage. After disentangling himself from the severed control cables wrapped around him, he was thrown from the separated tail section and made a successful parachute jump. He landed on the edge of a gulch with rocks below. Tail Gunner Sgt Herman L. Hodge also landed on the edge of the gulch, but was dragged over the edge into the rocks by his partially inflated parachute. S/Sgt Culp and Sgt Hodge were both captured but Sgt Hodge died the next day from a fractured skull and other injuries. The enlisted crewman were imprisoned at Stalag 17-B.